If you spend several hours a day in front of a computer, I can't begin to tell you what a difference a mechanical keyboard can make. In addition to better typing accuracy and speed, the clicky keys can just make you feel more productive. If you haven't taken the plunge yet, there's a great deal available today to get you started. 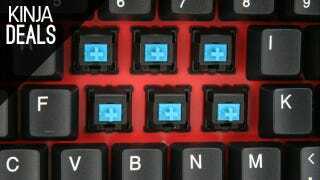 You might not be familiar with the Rosewill RK-9000, but it actually uses the exact same Cherry MX Blue key switches as the world-famous Das keyboard, widely-regarded as the best typists' keyboard still in production today. The biggest difference between the two keyboards is price; at $60, you could buy two of these Rosewills for less than a Das. Update: Sold out at Amazon, but Newegg has price matched. This post is brought to you by the Commerce Team . We bring you the best deals every morning on Kinja Deals, and collaborate with you to find the best products on Kinja Co-Op. We operate independently of Editorial, and if you take advantage of a deal we recommend, we may get a small share of the sale. Connect with us on Twitter and Facebook. We read the comments, and we want your feedback.